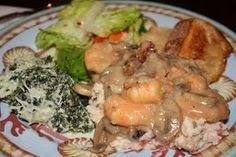 A Southern classic, shrimp and grits seems to be on the menu at most restaurants in the south, especially if there is a fresh supply of seafood just down the street! I have loved this dish for many years but was always intimidated to try to serve it as I wasn't equipped with a really good recipe. That was until I had a holiday lunch at Sallie Norton's house a couple of years ago. She made this delicious dish and I was hooked! I made it for my family at Sunday dinner soon after that and ever since it has been our go-to recipe whenever we have a craving for shrimp and grits. After trying my Aunt Jean's tomato grits, I thought it would be delicious to combine the two so while we were on Amelia Island I decided to try a little experiment. I made the tomato grits but used extra sharp white cheddar cheese and then followed this recipe for the shrimp. It was a lovely combination and everyone seemed rather pleased with the outcome! Cook bacon in a large skillet until crisp; remove bacon, and drain on paper towels, reserving I tablespoon drippings in skillet. Crumble bacon, and set aside. Sprinkle shrimp with pepper and salt; dredge in flour. Saute mushrooms in hot drippings in skillet 5 minutes or until tender. Add green onions, and saute 2 minutes. Add shrimp and garlic, and saute 2 minutes or until shrimp are lightly brown. stirring to loosen particles from bottom of skillet. Serve shrimp mixture over hot cheese grits.